The Louvre is an art lover’s dream. I had been twice before but I decided to go back again during my last trip to Paris because my boyfriend, Russell, had never been and my appreciation for art has increased since I have been living in NYC. Also, you can never say you’ve completely explored the Louvre, there is always more to see. I don’t think you can say you have been to Paris if you have not visited the Louvre. No Paris Bucket List would be complete without it! Not only does the Louvre have an amazing collection of artwork, but the building itself is one of the most impressive I have ever been inside. I wanted to share some background information and my tips for visiting the Louvre so that you can make the most of your time seeing one of the most impressive art collections in the world. How do you pronounce the Louvre? How Do You Get to the Louvre? How long does it take to see the Louvre? What are the Louvre Opening Hours? When is the best time to visit the Louvre? How much is admission to the Louvre? Can you buy tickets for the Louvre in advance? Does the Louvre have free admission days? Can you take pictures in the Louvre? Is the Louvre worth it? The building that houses the Louvre Museum was originally built as a defensive fortress in the late 12th to 13th century under Philip II. You can see remnants of the fortress in the basement of the museum. As Paris grew, the fortress lost its defensive function and, in 1546, and Francis I converted it into the main residence of the French kings. The building was extended many times to form the present Louvre Palace. In 1682, Louis XIV moved his household to the Palace of Versailles and the Louvre became just a place to display the royal art collection. In 1692, the building was occupied by the Académie des Inscriptions et Belles Lettres and the Académie Royale de Peinture et de Sculpture. The Académie remained at the Louvre Palace for 100 years. During the French Revolution, the National Assembly decided the Louvre would become a museum to display the nation’s masterpieces. The museum opened in 1793 with only 537 paintings, most of which were royal or confiscated church property. From 1796 to 1801, the museum had to close due to structural issues with the building. Under Napoleon, the museum was renamed Musée Napoléon and the collection grew. Then, after Napoleon’s abdication, many works had to be returned to their original owners. The collection grew during the reigns of Louis XVIII and Charles X, and then during the Second French Empire the museum gained 20,000 pieces. Fast forward to 1983, French President François Mitterrand proposed renovating the building. Architect I. M. Pei was awarded the project and designed a glass pyramid to stand over a new entrance in the main court, the Cour Napoléon. The Louvre Pyramid was completed in 1989 and La Pyramide Inversée (The Inverted Pyramid) was completed in 1993. The museum became even more popular with the new additions. In 2012, a satellite Louvre location was opened in Lens, France and in 2017, another location was opened in Abu Dhabi. The Louvre is the world’s largest art museum with 782,910 square feet of space filled with nearly 38,000 pieces of art from prehistory to the 21st century. It is significantly larger than the Metropolitan Museum of Art in NYC. There are several hundred thousand pieces that are part of the Louvre collection but not on display. It is also the world’s most visited museum, receiving more than 8.1 million visitors in 2017. The collection is divided into eight departments: Egyptian Antiquities; Near Eastern Antiquities; Greek, Etruscan and Roman Antiquities; Islamic Art; Sculpture; Decorative Arts; Paintings; and Prints and Drawings. The building has also been used as a prison and as an office for the finance ministry. During World War II, the Nazis used the museum to store stolen art. For those Da Vinci Code fans, there are three Arago medallions (markers on the old Paris Meridian Line) around the Louvre. We found one in the passageway from the Louvre to the courtyard and two in the courtyard. You should look for the Madonna of the Rocks painting in the main gallery. There are so many things to see at the Louvre, it can be overwhelming. I thought it might be helpful to share a few Louvre tips and tricks that I have learned from my visits. The Louvre is a popular museum so there can be lines to get in. We arrived a little before the museum opened and there was already a short queue. Once they opened, the line moved quickly and we were inside the Louvre in no time. If you are tight on time too, you might want to buy the timed tickets online in advance (see FAQ section below), the Paris Pass, or consider other options to pay extra to skip the line at the Louvre. Be prepared for the security checks at the Louvre entrances. If you can avoid it don’t bring any large bags. Anything over 21.5 x 13.5 x 7.5 inches needs to be put in a locker after it is examined. I should also mention there are three entrances to the Louvre. Most people use the entrance through the pyramid in the courtyard. You should only use this entrance if you have purchased advance tickets (including the Paris Pass). Otherwise, to save time, use the Porte des Lions entrance located on the wing closest to the Seine. It is the closest entrance to Mona Lisa’s location in the Louvre. We used the entrance to the Louvre through the shopping center (Carrousel du Louvre) by the pyramid inversee and the Apple Store. The line there was not too bad. Once you are inside, go straight to the Mona Lisa, you may be able to beat the crowd. We had a lot planned for our Paris trip so we only allocated three hours for the Louvre. I knew spending only three hours at such a huge museum would be challenging, so we made a list beforehand of the key pieces of art we wanted to make sure that we saw. This is critical! Even if you have more time, make a list of the pieces you must see, otherwise, with the size of the museum, you will miss them. Once you see the artwork on your list, then you can roam freely. Keep reading to find out my thoughts on the five best things to see in the Louvre. If you are not sure what you want to see or you want to learn more about the artwork in the Louvre, you can purchase a guided tour. Many of the Louvre guided tours also allow you to skip the line. Additionally, since the guide knows the way around the museum, you will see more artwork in less time than you would on your own. 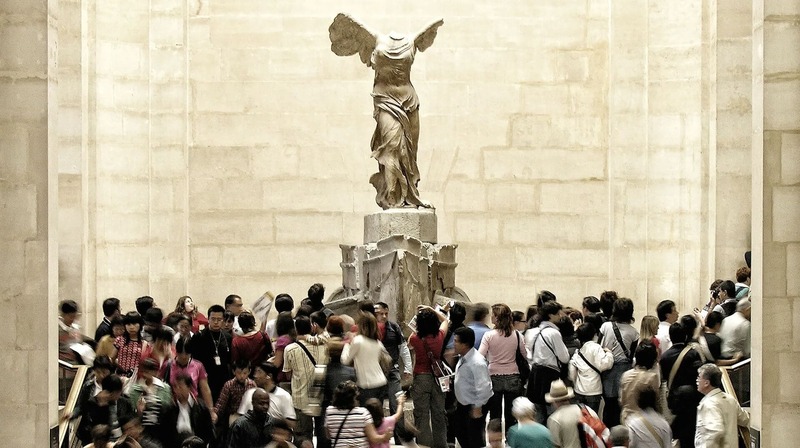 Be sure to book your guided tour of the Louvre in advance, as they are popular. If you would like to splurge, you can even do a Louvre private tour. I mentioned the museum is huge, let me also say it is very confusing and difficult to navigate. 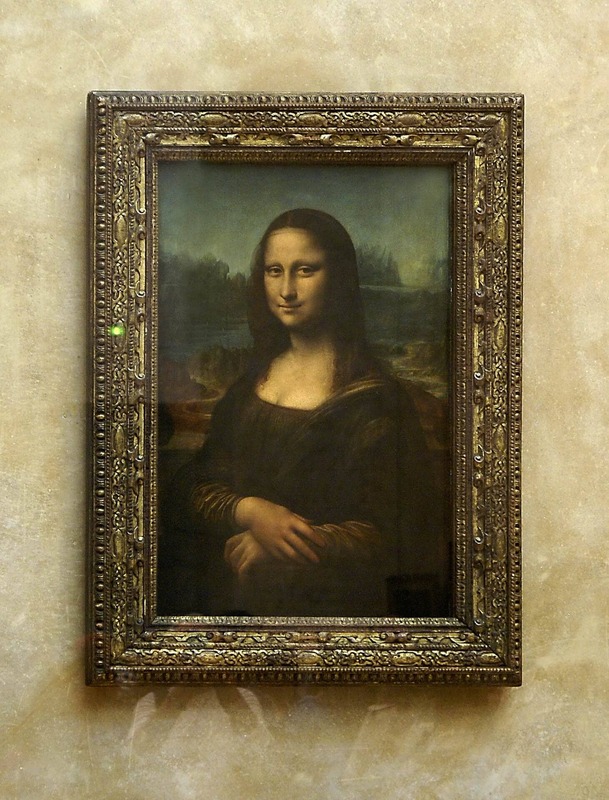 First of all, everything is in French, even the Mona Lisa is referred to as La Joconde. The map isn’t very detailed either. There are so many pieces of art in the Louvre and it’s just not feasible to list them all on the map. I did spend an extra few euros for an audio guide, but this was a waste of money. It was larger than any other audio guide I have used and it was supposed to use GPS to help direct you around the museum. The GPS was always behind where we were, so we ended up relying on the map instead. I hope they will make some improvements to the audio guide, as it has the potential to be a helpful guide to the Louvre. In the meantime, they have recently created a new app “My Visit to the Louvre” that you can use to create your very own personalized tour. The app also has a map of the Louvre and you can use it to buy advance tickets. Similar to other touristy spots, pickpockets may be in the museum. They operate in crowded areas when you are looking at the art. Stay alert, especially when taking selfies or pictures of the artwork. Make sure your bags are zipped all the way closed and don’t put your wallet in your back pocket. Also, be sceptical of any instructions that you get from strangers at the ticket machines. If you are targeted, contact a security officer. As I mentioned the Louvre is huge and you will be walking a lot, so it makes sense to wear comfortable shoes. You will be on your feet for the majority of your visit. My final Louvre Museum tip, it to make sure you also spend some time outside the museum in the courtyard. I love the Louvre pyramids. Although the pyramids are modern, I think they complement the classical architecture of the Louvre perfectly. If you want a fun picture, stand on one of the blocks and make it look like your finger is on top of the pyramid. We saw a lot of artwork in the three hours we spent at the Louvre, but there were definitely five pieces that were my favorite. 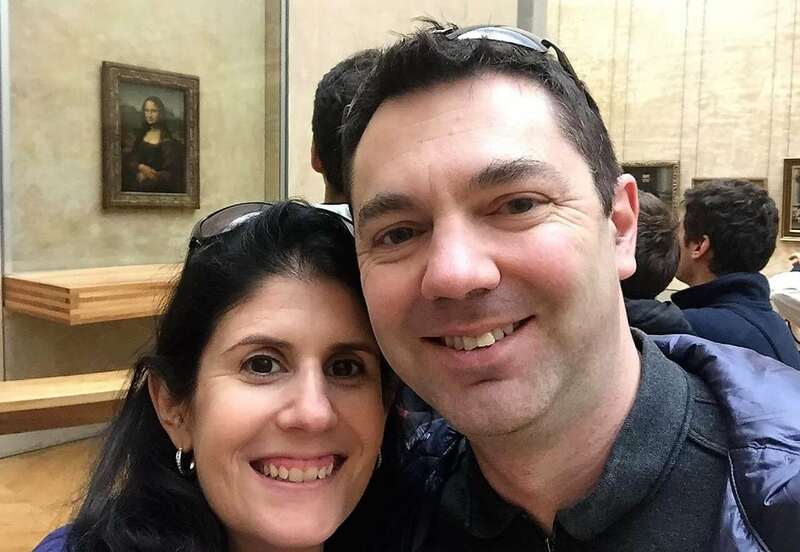 These days no visit to the Louvre is complete without taking a selfie with the Mona Lisa. Just remember that selfie sticks are not allowed! You will see signs guiding you to La Joconde, which is the French name of the painting, in room 6. Everyone always says that the painting is smaller than expected, so try to manage your expectations. Also, look at the painting from different parts of the room and notice how her eyes follow you. That’s the Mona Lisa optical illusion. Be sure to check out some of the other Italian paintings in the Louvre too. I love the story behind this sculpture. Psyche gave into to her curiosity but Cupid’s love is able to revive her. The artist does an amazing job of capturing the emotion and passion of the story. (You can read more about the Cupid and Psyche story here). If you walk to the back side of the sculpture, you will see the flask that Psyche couldn’t help but open. Ok so Napoleon’s Apartments may not exactly be a piece of art, but it is definitely worth seeing! As I mentioned above, the Louvre was a royal palace before Louis XIV decided it was not big enough and built the palace at Versailles. It’s fascinating to see the section of the Louvre set up like Napoleon’s apartments. Of course, there are paintings of Napoleon and his wife, Josephine. 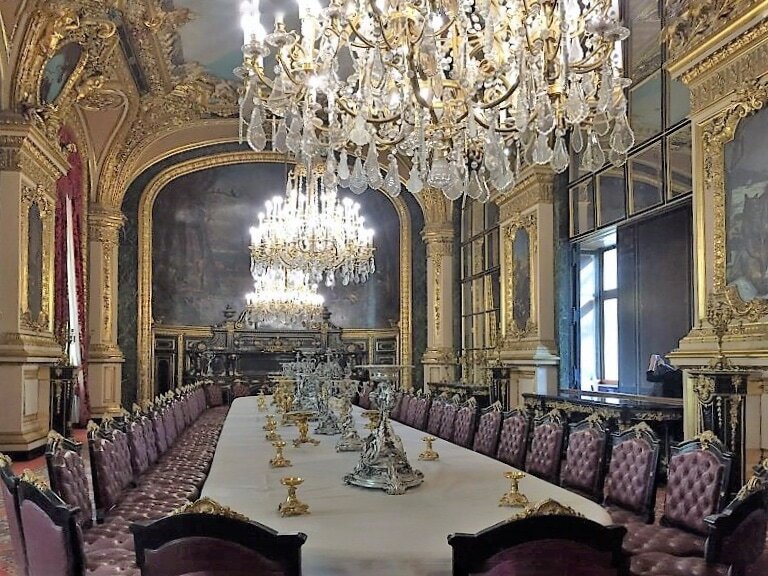 I also thought the formal dining room was impressive, the table is huge! The chandeliers throughout the apartments definitely stand out and demonstrate the opulence of the rooms. This sculpture of the Greek goddess, Nike of Samothrace, who is the goddess of Victory, was estimated to have been made around 200 BC. The statue was renovated in 2013 when some gaps in the marble were repaired. Additionally, the marble was cleaned and restored to its original color. Let me just say this statue is absolutely stunning, especially after the restoration. It doesn’t matter that pieces have broken off and have never been found. I will also say that the museum does a great job showcasing the piece in the marble Daru stairway. 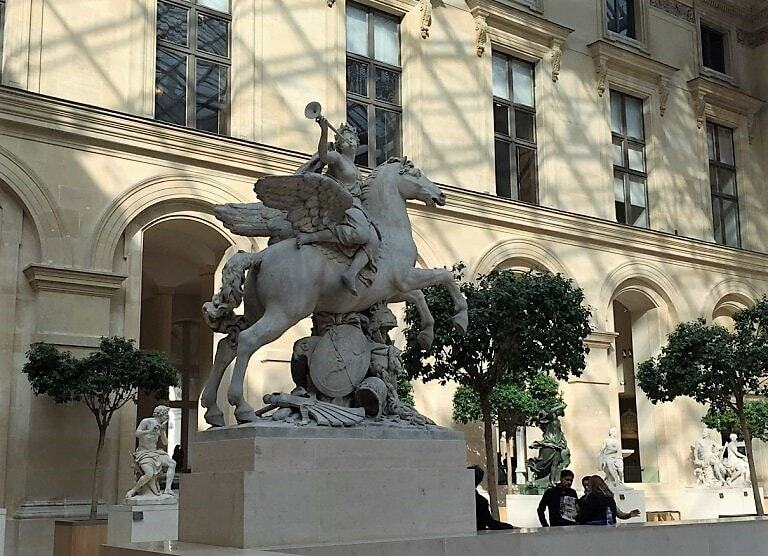 I think the museum did a great job showcasing the four impressive horse sculptures in the Marly courtyard. The white room with natural lighting is stunning. Wherever you stand in the room, the movement, strength, and violent struggle are evident, thanks to the details in the artwork. The artist brought life to the sculptures and captured the moment. The correct (French) way to pronounce Louvre is LOO-vruh. It is easy to take public transportation to get to the Louvre. I suggest using the metro. Use the Palais-Royal-Musée-du-Louvre stop on the 1 and 7 which will take you right into the Carrousel and the underground entrance. We saw signs with directions to the Louvre once we got off the metro. (Check out these tips for using the Paris Metro). If you prefer to take the bus, there are several bus lines that stop in front of the Pyramid including the 21, 24, 27, 39, 48, 68, 69, 72, 81, 95, and the Paris Open Tour bus. The Paris Hop On Hop Off bus included in your Paris Pass (for 1 day) also stops at the Louvre. The Louvre is huge, so it’s not possible to see everything in one visit even if you stayed all day. I suggest you figure out how much time you have in your itinerary to see the Louvre and then work around that. Hopefully, you can find at least 2-3 hours to spend at the museum, there is so much worth seeing. I would suggest visiting the Louvre as early as possible. Arrive a little before it opens if you can. The late evening hours on Wednesday and Friday are another good option. The best days to visit the Louvre museum are Wednesday to Friday. The museum will be more crowded on the weekends. Mondays can also be crowded because the nearby Orsay Museum is closed. Tuesday the Louvre is closed. As of 3/4/18, tickets purchased at the museum for a same-day visit is €15. This includes access to the Louvre permanent collection, temporary exhibitions, and the Musée Eugène-Delacroix. Louvre Fast Track admission is included as part of the Paris Pass. The Paris Pass allows you to see over 60 of the top attractions in Paris for free. Click here to get more information and check the price for the Paris Pass. Yes, you can now buy Louvre timed entry tickets on the website for a few euros more than purchasing them the day of at the museum. Tickets purchased online are time-stamped and include your name, so an identity document may be demanded. It is valid only for the stated experience (some special exhibitions are ticketed separately), date and time. It does not allow you to skip the queue but it does give you access to the pyramid within half an hour of the time shown on the ticket. If you don’t arrive within the time slot, you have to wait with visitors who have not purchased Louvre advance tickets. From October to March, on the first Sunday of each month, access to the permanent collection is free for all visitors. Also, every Friday after 6 pm, those under age 26, of all nationalities, can present valid identification for free entry to the Louvre. 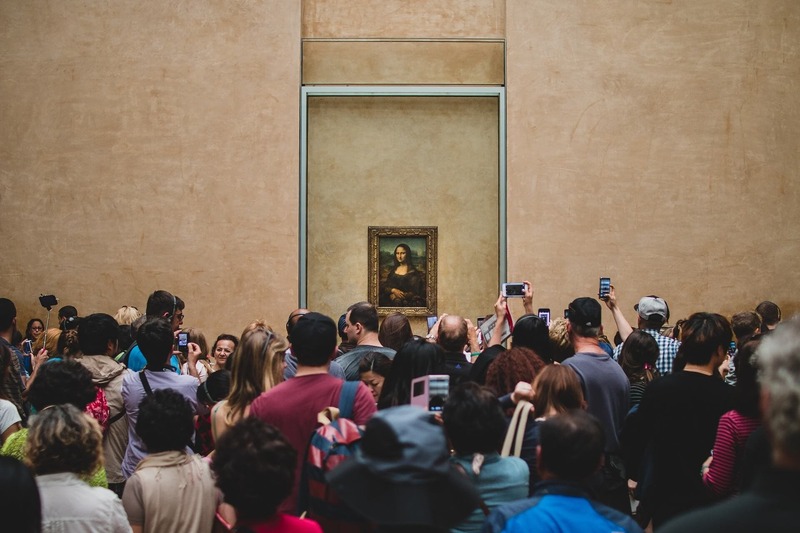 You can take photographs of artwork in the permanent collection but you may not use any flash during your Louvre museum visit. Yes! It is one of the most amazing museums in the world. The admission may sound pricey but when you compare it to some other top museums like MOMA in NYC, it is a steal! The real question is whether it is worth it to pay to skip the queues or do a guided tour. The answer to that depends on your preferences, budget, and time constraints. If you plan on doing a lot of sightseeing in Pass, consider the Paris Pass. It includes skip-the-line admission to the Louvre. Have you been to the Louvre? If not, I hope you get to the chance to go! With these Louvre museum tips, you can make the most of your visit. I would love to hear about your favorite Louvre art pieces. Have a game plan of what you want to see before you visit the Louvre, it’s not possible to see everything no matter how long you have to spend at the Louvre. 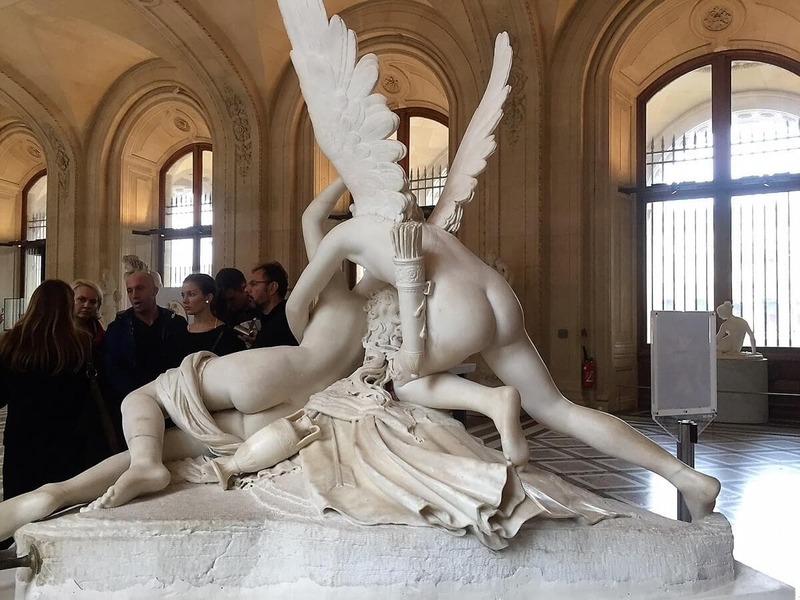 If you are tight on time consider a booking a Louvre Museum highlights tour. The best Louvre entrance is the Porte des Lions entrance located on the wing closest to the Seine. Get to the Louvre early and head straight toward the #1 piece of your list to see if before it gets too crowded. Don’t waste money on the audio guide, try a mobile app instead. 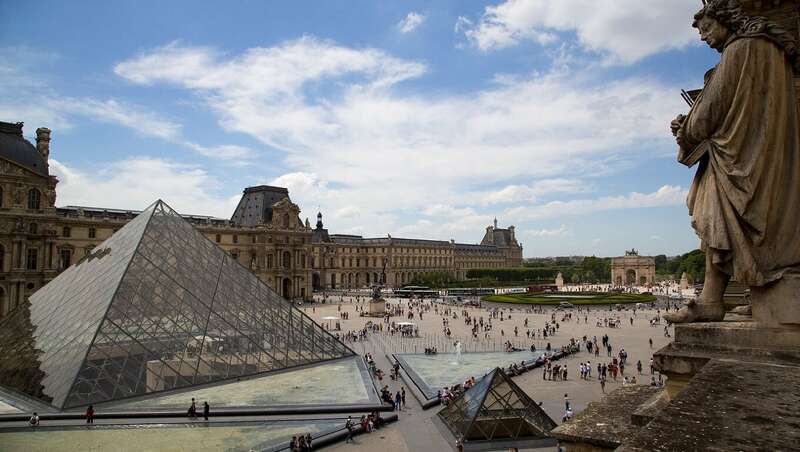 If you are planning on seeing other top attractions in Paris, you may be able to save money by purchasing the Paris Pass, which includes Louvre fast pass entry. Click here to get the details and prices for the Paris Pass. We did go in October, got there before it opened, and headed straight to the Mona Lisa. I agree, you need a game plan in the Louvre, it is that big. Like you, I went to see some specific pieces, got photobombed by Mona, and got totally lost trying to follow the “Sortie” signs to get out. Yes! The museum is like a maze! 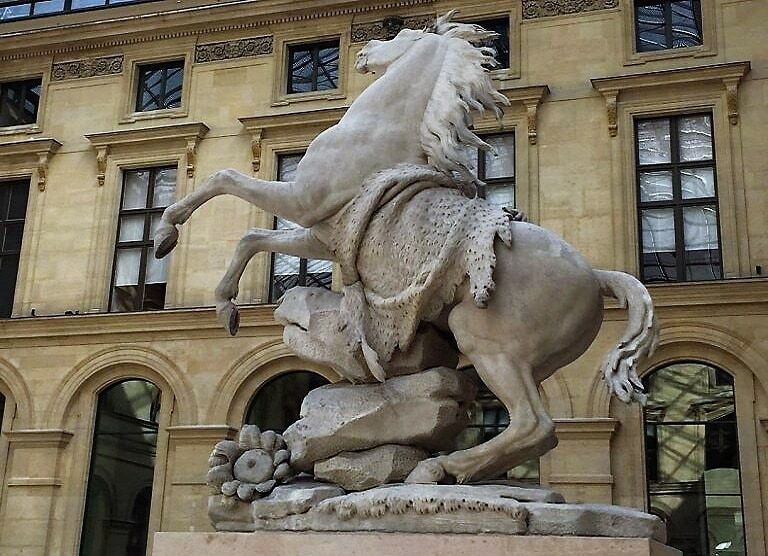 I agree, there is so much to explore in the Louvre, but I think you got to see some of the highlights. Those Italian sculpture sure are beautiful! Lyndall – Thanks, yes it was hard to choose 5 favorites with all the amazing art there! Having a game plan is essential! Winged Victory and Leonardo’s La Joconde were on our must-see list too. We also added works by the other Ninja Turtles (Michelangelo, Raphael and Donatello) as a joke because a couple of our grown kids had once adored them. I’d like to recommend that anyone who wishes to visit should pre-purchase tickets so as to avoid wasting valuable time in the queue. We were happy our Paris Pass allowed us to do that because by the time we had arrived, the ticket line had already snaked its way all around the enormous building. Linda – Thanks, great tips! I also really enjoyed Michelango’s Slaves, those were really nice. There are some of these that I wasn’t able to see during my visit. Like you said, the museum is so big that you have to plan what you want to see in advance. Then, during the time I visited, there was a bomb threat and half of the museum was closed. So, that narrowed the exhibits we wanted to visit. At least, I saw the Mona Lisa. Ruth – thanks for your comment. I can’t even imagine the chaos that the bomb threat caused. I’m glad you were at least able to see the Mona Lisa. Impressed that you narrowed it down to 5! I love the sculptures. They convey the most emotion I think. The large tapestries are all very impressive…. their scale and fine detail are amazing. Lillian – Thank you, yes it wasn’t easy. So many great pieces of art there and yes agree the tapestries are impressive. Thanks Molly. Always good to come across another Texan. Yes Winged Victory is amazing. Especially the way it is presented in the Louvre by the staircase. Thanks Vanessa. Yes it sounds like you are overdue for return visit. Glad I could suggest something new for you to see. And thanks for sharing additional information about Mona Lisa. it’s been more than ten years since I went there. Loved all the pieces there. Besides Mona Lisa, my favourite was Napoleon’s apartment. Thanks for bringing back my memories. Archana – Thank you. Nice to hear you enjoyed it too. Napoleon’s apartments are really impressive. I wish I read this guide before visiting Paris. Very insightful! I love 💕 Paris, love reading about it and love Visiting Paris.And you are so right you have to plan in advance and make up your mind on which parts of the museum you want to see. Twice in Louvre I have lost my bearnings had been going around in circles. I have been five times to Louvre , I still don’t think I have seen the entire museum. Happy travelling !!!!! 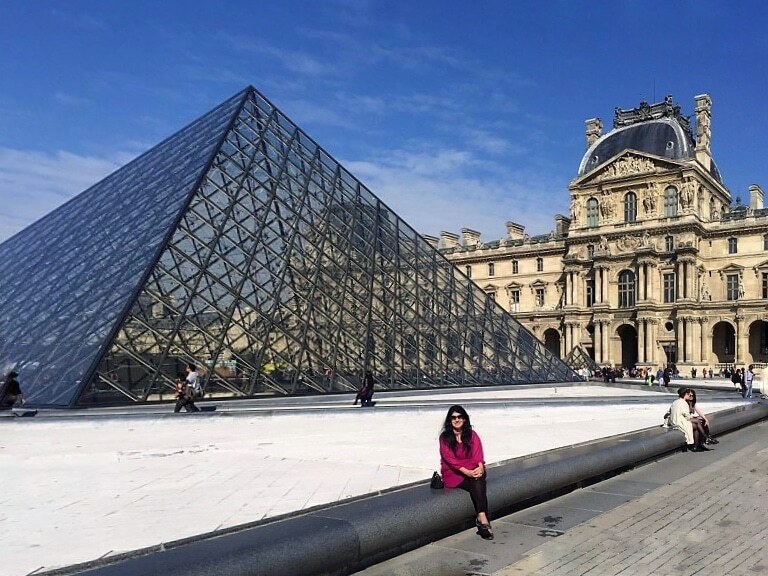 Ushasita – Glad to hear you love Paris too. It is so easy to get lost in the Louvre. I still need to see more of the Louvre too. Such a great post! 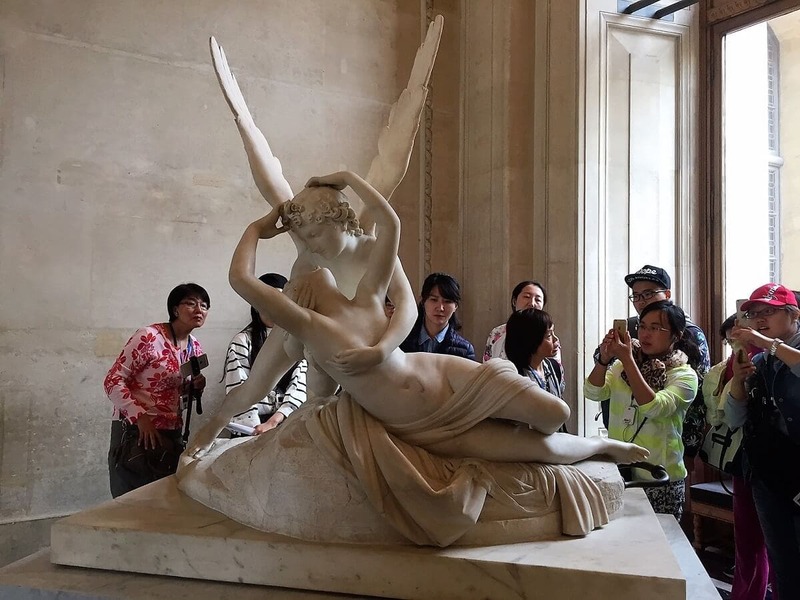 The Louvre is a must-see in Paris and these are great tips. Winged Victory is probably top of my list, I’m so glad it made your top 5. Thanks Lana. Winged Victory especially the way it is displayed in the stairway is so impressive. Such great tips! I really had no concept of how large the Louvre is. I got so lost with the audioguide and i would have muh preferred a tour guide to help me out! Next time I’ll do that! Thank you Kelly! Yes, the Louvre is just huge and so easy to get lost. Wow! That’s a comprehensive guide, thank you for sharing! Didn’t know that Louvre served as a prison, quite interesting fact! Stefanie – Thanks, yes there are a lot of unique considerations for visiting the Louvre. Glad you found it interesting.